PORT ARTHUR, Texas—A year after Hurricane Harvey upended the lives of most people here, the concrete floors on Laura Welch’s home remain uncovered, her kitchen is only partially usable and she has to wash dishes in a bathtub. Ever since the storm flooded the three-bedroom home she shares with her 20-year-old daughter and 15-year-old special-needs son, Ms. Welch has received $12,000 from the Federal Emergency Management Agency out of the approximate $40,000 she said she needs to fully restore it. There are piles of carpet, tile and other materials that have been purchased, but they sit near her front doorway until she can afford to have them installed. “All we want is to have our house back, but I just can’t do it on my own,” the 52-year-old social worker said as her son, Kobe King, who suffers from muscular dystrophy, played on a tablet computer in his wheelchair. With a poverty rate of 29%, Port Arthur was among the poorest communities along the Texas Gulf Coast before Hurricane Harvey—and in the year since, it has struggled to recover from flooding that left almost the entire city of 55,000 underwater. The 60.5 inches of rainfall recorded just north of Port Arthur over four days broke a new U.S. record for a storm total, and covered many homes up to their rooftops. Home to one of the nation’s largest concentrations of oil refineries, Port Arthur was still recovering from direct hits from two other hurricanes, Rita in 2005 and Ike in 2008, when it was inundated by Harvey in late August last year. The storm caused as much as $1.3 billion in damage in Port Arthur, according to a city recovery plan. Despite 80% of the housing being damaged, the city trails many others along the Gulf Coast in rebuilding. That’s in part because, so far, roughly $10 billion in approved disaster aid for the Harvey region has been slower to reach it, according to housing advocates. For example, the Texas General Land Office in June allocated 80% of the state’s first $58 million in federal Harvey housing aid to Harris County, where Houston is located, with the rest dispersed for rental housing in three tourism-dependent counties. Coastal tourist towns like Rockport and Port Aransas have reopened many of their closed hotels and shops, but Port Arthur’s Jefferson County didn’t get any of that initial funding. Port Arthur recently was allocated $15.7 million out of $156.7 million in federal money slated for communities in southeast Texas for home buyouts, infrastructure repairs and other housing needs. But, critics say, per home, the city came out far below most other cities. Port Arthur received $71 per home, compared to as high as $151,495 in one upscale community, according to an analysis of the grant money by Texas Housers, a housing advocacy group in Austin. The group suggested race might have been a factor: Port Arthur has a relatively high percentage of African-American and Latino residents, at 38% and 32%, respectively. Others say Port Arthur is more likely a victim of its geography, sitting 90 miles east of the giant Houston metro area. “If you are a big city like Houston, you get attention,” said Rosa Rios Valdez, president and chief executive officer of Business and Community Lenders of Texas, a nonprofit that has brought in donated supplies and other relief to Port Arthur and other flood-damaged cities. Brittany Eck, spokeswoman for the General Land Office, dismissed race as a motive, noting the official who heads the agency’s disbursement program is African-American. She said her agency doled the money out in accordance with guidelines from the U.S. Department of Housing and Urban Development, which specifies where it should go. A HUD spokesman deferred comment to the state. Ms. Eck also said the land office this month awarded $13.3 million to a project for low-income housing in Port Arthur, subject to a final review. Officials of the Southeast Texas Regional Planning Commission, which is disbursing the $156.7 million, said Port Arthur received the largest amount of any local city in its three-county region, which doesn’t include Houston’s Harris County. Beatrice Sanders is living in a FEMA trailer parked next to her home, which Harvey left uninhabitable with rot and mold. Federal aid was so slow in coming to Port Arthur after Hurricane Rita in 2005 and Hurricane Ike in 2008 that the city just received a check for about another $2 million in Ike relief money last month, Mayor Derrick Ford Freeman said. Beatrice Sanders said she also was still awaiting government help in rebuilding from Hurricane Ike when Harvey hit and flooding rains submerged her house. 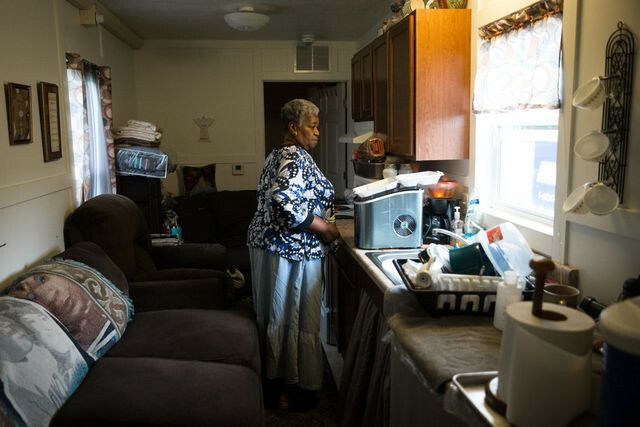 Now, a year later, the 71-year-old great-grandmother is still living in a FEMA trailer parked next to her home, which Harvey left uninhabitable with rot and mold. Ms. Sanders said the $17,000 she has received from FEMA isn’t nearly enough for the $80,000 she estimates it will cost to rebuild. “I hardly ever smile, because it’s not a happy story,” Ms. Sanders said as she sat in a rocking chair outside her home, with her Chihuahua, Jake. Meanwhile, Mr. Freeman himself remains shut out of his three-bedroom home, pending the arrival of federal aid to repair extensive damage. He, his wife and their five children are sharing a relative’s two-bedroom home. The post As Texas Recovers From Harvey, Port Arthur Struggles appeared first on Real Estate News & Insights | realtor.com®.